Purpose: Glutathione is a tripeptide consisting of cysteine, glycine, and glutamate and functions as a major antioxidant. It is synthesized endogenously in humans. Glutathione protects thiol protein groups from oxidation and is involved in cellular detoxification for maintenance of the cell environment. Reduced glutathione (GSH) has a skin-whitening effect in humans through its tyrosinase inhibitory activity, but in the case of oxidized glutathione (GSSG) this effect is unclear. We examined the skin-whitening and skin-condition effects of topical GSSG in healthy women. Subjects and methods: The subjects were 30 healthy adult women aged 30 to 50 years. The study design was a randomized, double-blind, matched-pair, placebo-controlled clinical trial. Subjects applied GSSG 2% (weight/weight [w/w]) lotion to one side of the face and a placebo lotion to the other side twice daily for 10 weeks. We objectively measured changes in melanin index values, moisture content of the stratum corneum, smoothness, wrinkle formation, and elasticity of the skin. The principal investigator and each subject also used subjective scores to investigate skin whitening, wrinkle reduction, and smoothness. Analysis of variance was used to evaluate differences between groups. 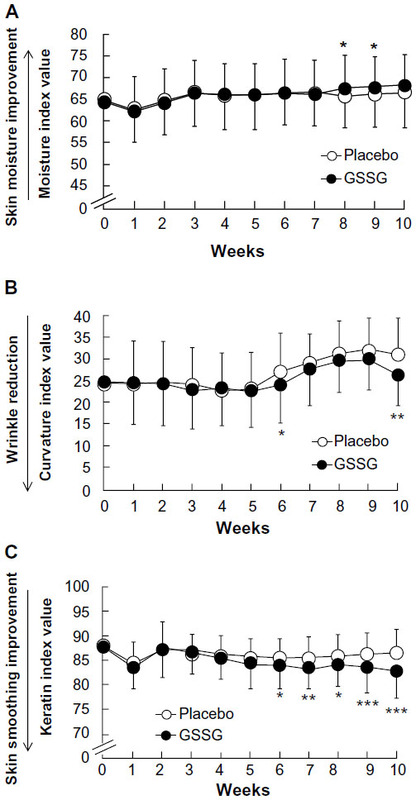 Results: The skin melanin index was significantly lower with GSSG treatment than with placebo from the early weeks after the start of the trial through to the end of the study period (at 10 weeks, P<0.001). In addition, in the latter half of the study period GSSG-treated sites had significant increases in moisture content of the stratum corneum, suppression of wrinkle formation, and improvement in skin smoothness. There were no marked adverse effects from GSSG application. Conclusion: Topical GSSG is safe and effectively whitens the skin and improves skin condition in healthy women. Skin aging is a complex biological phenomenon consisting of two independent clinically and biologically distinct processes, namely “intrinsic aging” and “extrinsic aging.”1,2 Extrinsic aging (including “photoaging”) is the result of exposure to outdoor elements, primarily ultraviolet (UV) irradiation. Photoaged skin shows a variety of age-associated clinical alterations, including deep wrinkles, sallow discoloration, and irregular pigmentation. Recently, it has been revealed that reactive oxygen species (ROS) produced excessively in the cells are involved in the process of skin aging caused by UV exposure.3 ROS have a paradoxical action on melanocytes: in the skin they not only enhance depigmentation but also increase pigmentation. UVB-induced H2O2 in keratinocytes causes melanocyte degeneration in the skin of patients with vitiligo. In contrast, NO• induces melanogenesis by increasing the amounts of tyrosinase and tyrosinase-related protein 1.3 Melanogenesis associated with ROS is suppressed by antioxidant treatment. NO• production via the stabilization of NO synthase contributes partly to the suppression of melanogenesis by ascorbic acid. N-acetyl cysteine (a precursor of glutathione) inhibits alpha-melanocyte-stimulating hormone induction by UVB irradiation. Glutathione, a tripeptide of cysteine, glycine, and glutamate, is a primary antioxidant in the body and plays important roles in maintaining intracellular thiol status and in detoxification. Although glutathione exists in both reduced (GSH) and oxidized (GSSG) states (Figure 1), the majority of its pool in the body is in the reduced form. GSH exerts antioxidant activity by acting as a free-radical scavenger during the reductive detoxification of hydrogen peroxide and lipid peroxide.4,5 In mammalian cells, GSH serves as an electron donor. During electron donation it is converted to GSSG by glutathione peroxidase, but it is reduced back to GSH by glutathione reductase in the presence of nicotinamide adenine dinucleotide phosphate.5,6 GSH has a variety of physiological effects. Importantly, it inhibits melanogenesis by suppressing the activity of tyrosinase, and oral administration of GSH in humans reduces melanin production in the skin.7–9 GSH in aqueous solution is highly unstable and easily decomposed. For this reason, there have been no reported investigations of the skin-whitening effect of GSH in topical formulations, unlike in oral formulations. In contrast, GSSG is less susceptible to decomposition in aqueous solution and is suitable for use in liquid form, although the skin-whitening effect of topical GSSG is unknown. Here, we therefore investigated the skin-whitening and skin-condition effects of the topical application of GSSG in healthy female subjects. Figure 1 Structural formulae of GSH and GSSG. Abbreviations: GSH, reduced glutathione; GSSG, oxidized glutathione. We screened 80 healthy Filipino female candidates and selected 30 subjects who met the criterion of only a small difference in the melanin index between the left and right sides of the face. These 30 subjects satisfied the additional inclusion criteria of age 30 to 50 years and face melanin index value of 200 to 350. The study was conducted at Clinical Trial Management and Testing Associates, Inc. (Muntinlupa City, Philippines). The study objectives and protocol were carefully explained to the subjects and their written informed consent was obtained. Both the test lotion and the control lotion were provided by Cathy Chemical Industry Co, Ltd (Osaka, Japan). The test lotion was composed of 2% (weight/weight [w/w]) GSSG (KYOWA HAKKO BIO CO., LTD., Tokyo, Japan), together with other ingredients, including 1,3-butylene glycol, mineral oil, 1,3-pentanediol, cetostearyl alcohol, self-emulsifiable glyceryl monostearate, ethylhexyl palmitate, polyethylene glycol monostearate, 1,3-hexandiol, 2-phenoxyethanol, carboxyvinyl polymer, polyacrylic acid amide, light liquid isoparaffin, polyoxyethylene lauryl ether, fragrance, and water (Table 1). The placebo lotion did not contain GSSG. The pH of both lotions was adjusted to 6.46 by using potassium hydroxide. Note: The pH of both lotions was adjusted to 6.46 by using potassium hydroxide. Abbreviations: GSSG, oxidized glutathione; w/w, weight/weight. This was a randomized, double-blind, placebo-controlled, matched-pair study. Two percent (w/w) GSSG lotion and placebo lotion were randomly assigned to either the right or the left side of the face of each subject. Approximately 0.5 g (coin size) of lotion was spread evenly on the designated test site twice daily (7:30 am to 9:00 am, 4:00 pm to 5:30 pm) for 10 consecutive weeks. Before the morning application, the subjects were instructed to wash their faces with soap and water and then pat the skin dry. Subjects were advised to refrain from eating too much spicy food at breakfast time during the study period. They were advised to avoid sun exposure and refrain from applying any other whiteners, moisturizers, make-up, or skin care products on the test sites or from taking oral supplements such as Vitamins C, E, and A, which could improve the condition of their skin. In the primary quantitative evaluation we assessed: 1) skin whitening, 2) skin moisture, 3) skin firmness, 4) efficacy against wrinkle reduction, and 5) skin smoothening. These were measured at baseline and weekly for 10 weeks (on Days 7, 14, 21, 28, 35, 42, 49, 56, 63, and 70). Subjective evaluations of some of the skin benefits being tested (skin whitening, wrinkle reduction, and skin smoothening) were also made and recorded during test lotion application. These subjective characteristics were assessed and scored by the investigator and the subjects themselves every other week (on Days 14, 28, 42, 56, and 70). Before the instrumental measurements were taken, the subjects were instructed to rest in the testing room for about 20 minutes for acclimation. Skin-whitening efficacy was quantified by means of the melanin index using a Mexameter® MX18 (Courage + Khazaka Electronic GmbH, Cologne, Germany). Whitening efficacy was tested in the cheekbone area. The melanin index recorded was the average of three readings. The measurement is based on the absorption principle.10,11 The probe emits light of three defined wavelengths and a receiver measures the light reflected by the skin and thus the light absorbed. The melanin is measured by using two of the three wavelengths, which are chosen to correspond to the different rates of light absorption by the melanin pigments. The moisture level or hydration state of the skin of the face was measured with a Corneometer® (Courage + Khazaka Electronic GmbH, Cologne, Germany). As with the Mexameter®, the test site was the cheekbone area. The Corneometer® uses capacitance to measure the moisture content of the stratum corneum. Skin elasticity was quantified with a Triplesense TR-3 sensor scan device (Schott Moritex Corporation, Saitama, Japan). The test site for wrinkle reduction and skin smoothening was the “crow’s feet” at the outer corner of the eye. SkinSys software (Sometech Inc, Seoul, South Korea) and a Coccam digital camera (Beauty Korea World Co Ltd, Seoul, South Korea) were used. SkinSys is professional skin analysis and treatment software that enables the user to perform a well-organized scientific evaluation of cosmetic products. The skin analysis and measuring functions include: 1) 3D analysis of skin curvature (wrinkle reduction); and 2) analysis of keratin content by using a precise edge-detection algorithm. 3= marked improvement or remarkable change or improvement (whitening; very visible change with even and uniform skin whitening covering more than 80% of the contact area). The objective data are expressed as means ± standard deviation. The Wilcoxon signed-rank test, which is a non-parametric statistical hypothesis test, was used to compare the efficacy of 2% (w/w) GSSG lotion versus placebo lotion. SPSS 17.0.1 (SPSS Inc., Chicago, IL, USA) version was used for data analysis. All differences were considered significant at P<0.05. The trial was conducted in accordance with the trial protocol; the principles set forth by the National Guidelines for Biomedical/Behavioral Research of the National Ethics Committee of the Philippines; The Belmont Report: Ethical Principles and Guidelines for Protection of Human Subjects of Research; the World Medical Association Declaration of Helsinki regarding protection of the rights and welfare of human subjects who participated in the trial; and other applicable government regulations. This protocol was approved by Ina Research Philippines, Inc. (INARP)’s Institutional Review Board/Ethics Review Committee (Muntinlupa City, Philippines). All subjects completed the study. Subjects were monitored by the investigator during the study for the development of adverse reactions (eg, erythema, itching, sensation, dryness). One subject experienced mild erythema of the whole face on Days 2 and 3. However, the erythema had disappeared by Day 4 without the need to discontinue the application of both lotions. No adverse reactions related to GSSG were reported during the study period. All subjects tolerated the GSSG lotion well and reported no untoward symptoms. The results based on the Mexameter® measurements are shown in Figure 2. Melanin index values decreased slightly after 10 weeks’ application of the placebo lotion (Week 0: 274.13±25.82; Week 10: 265.50±25.81). In contrast, sites that received GSSG lotion showed a clear decrease in melanin index values, beginning in the early weeks of the study period (Week 0: 272.77±26.17; Week 10: 243.47±26.31). From Weeks 1 through 10, the melanin index values of the sites that received GSSG lotion were significantly lower than the values of the sites that received placebo lotion. Figure 2 Changes in melanin index values with GSSG treatment. Notes: *P<0.05; **P<0.01; ***P<0.001 versus placebo. P-values were calculated by using the Wilcoxon signed-rank test. Values are expressed as means ± standard deviation (n=30). The results based on the Corneometer® measurements and SkinSys software analyses are shown in Figure 3. Moisture index values measured with the Corneometer® at GSSG sites were significantly higher than those at placebo sites in Weeks 8 and 9 (Figure 3A). Curvature index values and keratin index values calculated by SkinSys software analysis are shown in Figure 3B. 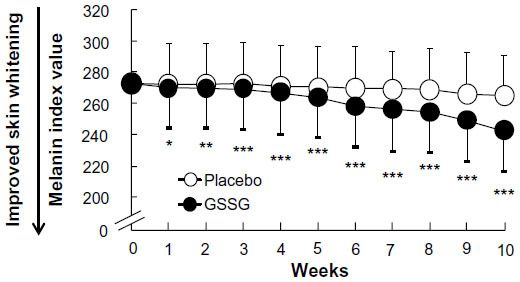 The curvature index values were significantly lower at GSSG sites than at placebo sites in Weeks 6 and 10. The keratin index values were significantly lower at GSSG sites than at placebo sites from Weeks 6 to 10 (Figure 3C). However, the elasticity index values measured with the Triplesense TR-3 did not differ significantly between the sites that received GSSG and those that received placebo (data not shown). Figure 3 Moisture index, curvature index, and keratin index results during intervention. Notes: (A) Changes in moisture index values; (B) in curvature index values; and (C) in keratin index values with GSSG treatment. *P<0.05; **P<0.01; ***P<0.001 versus placebo. P-values were calculated by using the Wilcoxon signed-rank test. Values are expressed as means ± standard deviation (n=30). 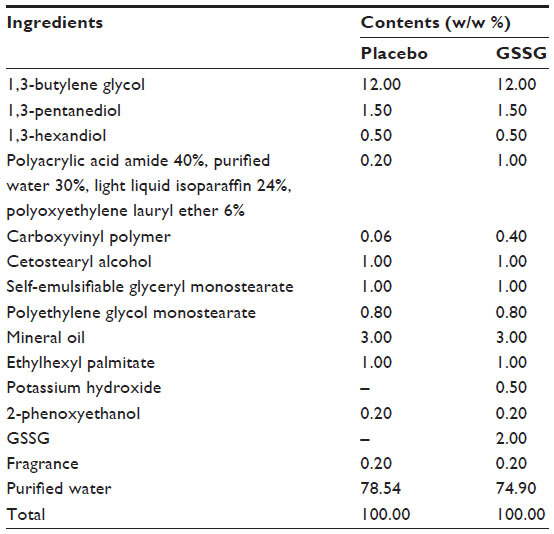 The investigator and the subjects subjectively evaluated the skin benefits of the GSSG and placebo lotions in accordance with a scoring scale (see “Materials and Methods”). Scores of 2 or more were indicative of skin benefits assessed as visibly significant by both the investigator and the subjects. Scores of 3, −2, or −3 were not recorded by the investigator or by any of the subjects. In the investigator’s assessment of skin whitening, 3.3% of the subjects received a score of 2 at Week 10 for placebo sites (Table 3). In contrast, a skin-whitening score of 2 was received by 13.3% (Week 6), 36.7% (Week 8), and 66.7% (Week 10) of subjects at GSSG sites. In the investigator’s assessment of wrinkle reduction, none of the sites that received placebo lotion received a score of 2. However, a wrinkle-reduction score of 2 was received by 3.3% (Week 4), 10.0% (Week 6), 20.0% (Week 8), and 33.3% (Week 10) of subjects at GSSG sites. Skin-smoothing efficacy did not differ between the placebo and GSSG sites in the investigator’s assessment (data not shown). Note: Data are expressed as percentages of the total number of subjects. 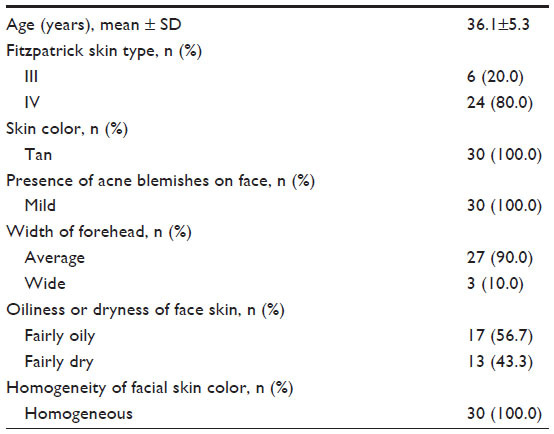 In the subjects’ assessments of skin whitening, 23.3% of subjects gave a score of 2 to the placebo sites at Week 10 (Table 3). In contrast, 13.3% (Week 6), 33.3% (Week 8), and 76.7% (Week 10) of subjects gave a skin-whitening score of 2 to GSSG sites. None of the subjects reported wrinkle reduction at placebo sites. However, 3.3% (Week 4), 10.0% (Week 6), 20.0% (Week 8), and 30.0% (Week 10) of subjects gave a wrinkle-reduction score of 2 to GSSG sites. In the subjects’ assessments, skin-smoothing efficacy did not differ between the sites that received placebo and those that received GSSG (data not shown). We evaluated the effects of the topical application of a lotion containing GSSG to the face for 10 weeks. We used the melanin index value, which reflects the skin melanin content, as an objective outcome indicator, and we added subjective assessments by the investigator and by study participants. These evaluations revealed the positive effects of GSSG lotion, suggesting that its topical use effectively whitens skin. GSH is one of the compounds that inhibits melanin production. GSSG is readily reduced to GSH in the body by glutathione reductase. The presence and enzymatic activities of glutathione reductase and glutathione peroxidase in the human dermis and epidermis have been demonstrated before.15 In addition, our preliminary findings in a skin permeability test using a 3-dimensional cultured skin model show that at least some of the GSSG in the stratum corneum side penetrates through the epidermal barrier (data not shown). Therefore, we can assume that a fraction of the GSSG applied to the skin is converted to GSH and acts on melanocytes in the epidermis, thus whitening the skin. The mechanisms by which GSH inhibits melanogenesis have been studied well in vitro. One mechanism is the inhibition of tyrosinase activity; this is a well-known function of thiol compounds in general, including GSH and cysteine.8,9 Tyrosinase is the rate-limiting enzyme controlling the production of melanin and catalyzes the conversion of L-tyrosine supplied from the blood to 3,4-dihydroxyphenylalanine, then to dopaquinone. Like GSH, kojic acid, arbutin, and hydroquinone currently commonly used to whiten skin, have inhibitory effects on tyrosinase.16–18 However, application of 2% hydroquinone cream to the face for 31 days did not decrease melanin index values in Asian women.19 At least with application at the same concentration, GSSG appears to be superior to hydroquinone. 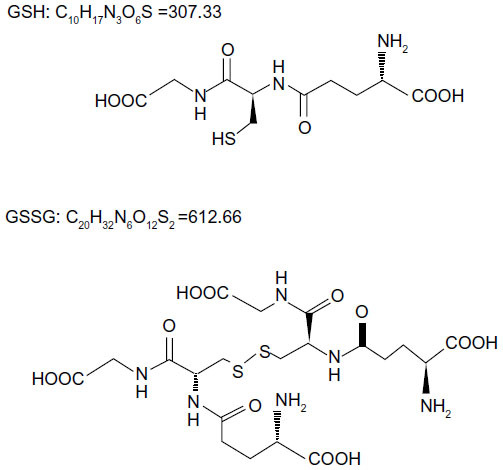 Third, the skin whitening effect of GSH is attributed to its antioxidant activity.16 GSH has the ability to scavenge ROS generated in epidermal cells following UV exposure and to thus prevent ROS-induced melanogenesis.24 Other skin-whitening agents that have antioxidant activity and melanogenesis-inhibitory effects include L-ascorbic acid and its derivatives.16 The antioxidant activity of GSSG itself has not been reported. However, we have a preliminary result: the minimal erythemal dose of GSSG was significantly increased by its application to the UV-irradiated skin of hairless mice (data not shown). This finding suggests that the topical effect of GSSG on the inflammatory response occurs via UV-induced oxidative stress. We therefore speculate that there is a relationship between GSSG skin-whitening efficacy and oxidative stress. Taking all of these findings into account, the inhibitory action of GSH on melanogenesis is evident. Moreover, oral intake of GSH enhances skin whitening in human subjects when melanin index values, reflecting melanogenesis inhibition as an outcome indicator, are used. Arjinpathana and Asawanonda found that healthy medical students who took 250 mg of GSH orally twice daily for 4 weeks had significantly lower melanin index values (as measured on the cheek and on the sun-exposed forearm) than those who received placebo.7 This result is likely related to the effect of either GSH or cysteine; when either of these is added to melanocytes or melanoma cell lines, melanogenesis is shifted toward pheomelanin formation.7 Unlike the case with GSH, no previous report has demonstrated the in vivo skin-whitening effects of GSSG, an oxidized form of GSH, in topical or oral form. The above-mentioned mechanism of the skin-whitening efficacy of topical GSSG and its relationship to GSH are not clear and are no more than speculation. This is a limitation of our study, and the mechanism by which topical GSSG whitens skin effectively will have to be revealed by further studies. Our study showed that topical application of GSSG lotion effectively reduced wrinkle formation in both objective and subjective evaluation tests. Furthermore, in our objective evaluation, skin moisture levels were significantly higher at sites that received GSSG lotion than in those that received placebo, indicating the moisturizing effect of GSSG. However, in the objective evaluations the degree of change except for melanin index value was not large. One reason for this may be that the subject selection criteria in relation to skin condition included only the melanin index value, an indicator of skin whitening. Inclusion of selection criteria that reflect skin conditions other than skin whitening would be more suitable for evaluating each skin condition. Defective wound healing in patients with diabetes results from dysfunction of skin fibroblasts and epidermal keratinocytes; this dysfunction is related to the disruption of intracellular GSH homeostasis. Deveci et al showed that GSH enhances collagen contraction in human dermal fibroblasts and protects the keratinocytes from apoptosis under hyperglycemic conditions.25 However, the mechanisms by which topical GSSG reduces wrinkle formation and improves skin moisture levels are unclear. In conclusion, our study indicates that GSSG is a potent agent that can promote skin whitening and improve skin condition. We speculate that these effects of GSSG are attributable, at least partly, to the anti-aging action of GSH, because GSSG is converted to GSH in the skin. It is difficult to evaluate the effect of GSH in topical aqueous solution because of its instability. GSSG is therefore likely to be more beneficial than GSH, especially for topical use. The skin-whitening effect observed here in healthy females after GSSG application represents an important, novel finding. As described in the “Results” section, no adverse reactions related to GSSG were reported during the study period. Our clinical trial was conducted in the Philippines, which has a tropical climate. Subjects were advised to avoid applying sunscreen. However, the daily skin environment did not differ from that before the trial because the subjects were not in the habit of applying sunscreen. Nevertheless, the mechanism by which topical GSSG effectively whitens skin is not clear, and the relevance of GSH reduced from topical GSSG in the skin is no more than speculation. Furthermore, because there has been no other reported clinical trial of GSSG application, more studies will need to be accumulated in future to determine the safety of its long-term use. We demonstrated that GSSG application to the face whitened the skin and improved skin condition in healthy women. Further studies are needed in future to clarify the mechanisms by which topical GSSG produces these skin benefits. The authors thank Ina Research Inc. as the Contract Research Organization and Ina Research Philippines, Inc. as the Site Management Organization for the clinical trial. Substantial contributions to conception and design, acquisition of data, or analysis and interpretation of data: FW, EH, GPC, and AK. Drafting of the article or critical revision of important intellectual content: FW and AK. Final approval of the version to be published: FW, EH, GPC, and AK. Agreement to be accountable for all aspects of the work in ensuring that questions related to the accuracy or integrity of any part of the work are appropriately investigated and resolved: AK. All authors contributed toward data analysis, drafting and revising the paper and agree to be accountable for all aspects of the work. The authors report no conflicts of interest in this work. This research received no specific grant or funding from outside organizations. Dawson JB, Barker DJ, Ellis DJ, et al. A theoretical and experimental study of light absorption and scattering by in vivo skin. Phys Med Biol. 1980;25(4):695–709. Kollias N, Baqer AH. Quantitative assessment of UV-induced pigmentation and erythema. Photodermatol. 1988;5(1):53–60. Holm EA. Skin Colour and Pigmentation. In: Fluhr JW, editor. Practical Aspects of Cosmetic Testing. Berlin: Springer-Verlag Berlin Heidelberg; 2011:179–185. Nordlund JJ, Boissy RE. The biology of melanocytes. In: Freinkel RK, Woodley DT, editors. The Biology of the Skin. New York: Parthenon Publishing Group; 2001:113–130. Petersen MJ. Aging of the skin. In: Freinkel RK, Woodley DT, editors. The Biology of the Skin. New York: Parthenon Publishing Group; 2001:209–217. Shindo Y, Witt E, Han D, Epstein W, Packer L. Enzymic and non-enzymic antioxidants in epidermis and dermis of human skin. J Invest Dermatol. 1994;102(1):122–124. Briganti S, Camera E, Picardo M. Chemical and instrumental approaches to treat hyperpigmentation. Pigment Cell Res. 2003;16(2):101–110. Sakuma K, Ogawa M, Sugibayashi K, Yamada K, Yamamoto K. Relationship between tyrosinase inhibitory action and oxidation-reduction potential of cosmetic whitening ingredients and phenol derivatives. Arch Pharm Res. 1999;22(4):335–339. Puizina-Ivic N, Miric L, Carija A, Karlica D, Marasovic D. Modern approach to topical treatment of aging skin. Coll Antropol. 2010;34(3):1145–1153. Mauricio T, Karmon Y, Khaiat A. A randomized and placebo-controlled study to compare the skin-lightening efficacy and safety of lignin peroxidase cream vs 2% hydroquinone cream. J Cosmet Dermatol. 2011;10(4):253–259. del Marmol V, Solano F, Sels A, et al. Glutathione depletion increases tyrosinase activity in human melanoma cells. J Invest Dermatol. 1993;101(6):871–874. Benathan M, Labidi F. Cysteine-dependent 5-S-cysteinyldopa formation and its regulation by glutathione in normal epidermal melanocytes. Arch Dermatol Res. 1996;288(11):697–702. Benathan M, Virador V, Furumura M, Kobayashi N, Panizzon RG, Hearing VJ. Co-regulation of melanin precursors and tyrosinase in human pigment cells: roles of cysteine and glutathione. Cell Mol Biol (Noisy-le-grand). 1999;45(7):981–990. Kinnaert E, Duez P, Morandini R, Dubois J, Van Houtte P, Ghanem G. Cysteine but not glutathione modulates the radiosensitivity of human melanoma cells by affecting both survival and DNA damage. Pigment Cell Res. 2004;17(3):275–280. Maeda K, Hatao M. Involvement of photooxidation of melanogenic precursors in prolonged pigmentation induced by ultraviolet A. J Invest Dermatol. 2004;122(2):503–509. Deveci M, Gilmont RR, Dunham WR, Mudge BP, Smith DJ, Marcelo CL. Glutathione enhances fibroblast collagen contraction and protects keratinocytes from apoptosis in hyperglycaemic culture. Br J Dermatol. 2005;152(2):217–224.